Do NOT Fall Back to Sleep!!! My heart wants to celebrate for Standing Rock. It really does. However, my gut tells me that this is only a small win in a much larger problem. This is the first indication that people are becoming aware of what is going on under their noses as they are distracted by many other things, the use and decimation of the planet and themselves as a commodity to be sold for profit regardless of what it does to the planet and it's peoples. "DAPL Permit denied by Army Corps, DAPL says it will proceed anyway. Army Corps denied DAPL permit on Sunday, but DAPL owners said that nothing has changed and it will proceed as planned. Obviously they intend to get their way whether they do it legally or not. Below is a list of their partners published in the same article, who I am assuming are in total agreement with the policy of get it done any way you can. "The question is now whether President Obama will send in law enforcement or the military to halt DApL from drilling without a permit. 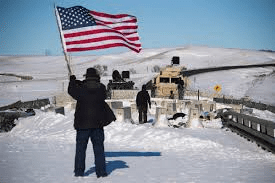 Otherwise, today's announcement will have no enforcement, It will be seen as another U.S. and corporate ploy to send home water protectors, and thousands of veterans, now at Standing Rock Camp, where more than 10,000 are camped." As you can see, the opening salvo has been settled, sort of. I cannot stress enough, the continued need for prayer, vigilance, non-violent protest. The game will be to next, distract us from this issue (which if it blossoms will go worldwide and on to other issues). At this point, this victory - IMO, this step in the right direction is actually meant to distract us from continuing. They would like us all to go home and quit playing 'the game'. Even more so, now that the mainstream media has gotten involved, expect them to slant this story and this news to the underlying agenda of the larger game, quietly and insidiously trying spin our opinion on the situation to their controlled, controlling, proscribed view of things. Which is exactly what we CANNOT do! and Don't fall back asleep! Expect very obvious, but nasty tactics to be next on the game plan. The fact that many woke up and added their voice to this issue is a major indicator that we are ready to be awake, and we must persevere. Because we have taken the first step along a long path towards the right direction, in freeing ourselves. Praying in utter peace, praying in an utterly nonviolent stance. Yet standing firm in this rising frequency, adamant and unmovable for what is right. And because of this prayer, we, the world, finally realize that it is our hearts that connect, it is our love for us and the planet that has the power. This is a boots on the ground demonstration of that principle that will unite a whole world in peace. A statement of sacred peace that has a strength to out weight the idiotic and clueless controllers. This will work, because it cannot fail. This is our future, as we build it. This is sacred, this is beautiful.